The 2010 U.S. News & World Report survey of undergraduate engineering programs ranks the Clark School 23rd in the nation, tied with Rensselaer Polytechnic Institute and the University of Washington. The Clark School is tied for 9th in the nation among public undergraduate engineering programs. 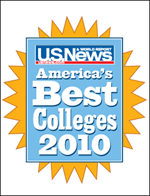 The 2010 edition of the rankings marks the Clark School's greatest number of top 20 programs, at five. The Clark School's Department of Aerospace Engineering moved from 9th up to 6th place--the highest ranking achieved by any Clark School unit to date. Among public aerospace engineering departments, the Clark School ranked 4th, the highest public program ranking achieved to date. Entrepreneurship programs offered by the Clark School's Maryland Technology Enterprise Institute (Mtech) and the Smith School of Business were ranked 11th.